Soft Skull Press, 9781593766191, 368pp. The year was 1981. The US was entering a deep recession, Russia was our enemy, and John Hinckley, Jr.'s assassination attempt on President Ronald Reagan shocked the nation. It was also the year author Andrea Kleine learned her close childhood friend had been violently murdered by her socialite mother, Leslie DeVeau. Both events took place in Washington, DC. Hinckley and Deveau were both sent to St. Elizabeth's hospital, guilty by reason of insanity. It was there that they met, and later became lovers. 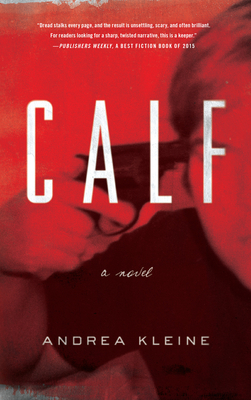 These two real-life, and ultimately converging events inspired Kleine's jaw-dropping, spine-tingling novel, CALF. Made up of dual narratives and told over the course of one year, Kleine's account follows a fictionalized John Hinckley Jr. as he stalks a young actress in the lead-up to the assassination attempt, and eleven-year-old Tammy, whose friend is murdered in her sleep. Part Are You There God, It's Me Margaret and part Taxi Driver, this creepy, unsettling, and absolutely addictive novel is at once a penetrating character study, a meditation on the zeitgeist of the '80s, and an unflinching depiction of violence, both intimate and sensational. Andrea Kleine is a writer and performance artist whose work has spanned dance, theater, film, literature, and interdisciplinary projects. She has received five MacDowell Colony fellowships and the New York Foundation for the Arts fellowship award. Her writing has been published in The Los Angeles Review of Books, Everyday Genius, NYFA Current, and on her blog, The Dancers Will Win. Calf is her first novel.